Revival is an alternative country band formed by Josh Read and Evan Berodt of Canyon and Jay Farrar’s touring band. 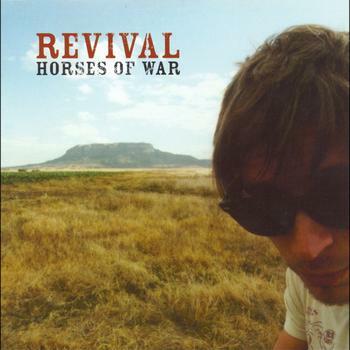 Their 2007 album, Horses of War, presents nine-songs of pure, straighforward joy. The album includes a variety of music styles, but the one thing that connects them all is the intimacy of the lyrics and the honesty of their delivery. Like waves that slowly swell up and wash over you, the subtle echoes of Josh Read’s vocals, paired with a nuanced bass and guitar, prove to be a calming and even enchanting combination. Horses of War opens with slow, undulating “Fog Rolling In,” and then segues into the poppiest track, “Dizzy.” The album gains momentum at just the right pace — allowing the songs space to breath and be enjoyed. One reviewer summed up the album perfectly, calling it an “interesting stew of quiet ballads and raging operatic anthems.” The album was recorded at Jawbox legend J Robbins’ Magpie Studio in Baltimore. Purchase HERE.